In LiveCode 4.6 experimental support has been added to the field for simple, single level, ordered and unordered lists. This lesson will show how to use this new feature and preserve the content. There is an example stack included with this lesson. The stack consists of a field and four buttons that set bullet points on the content of the field. 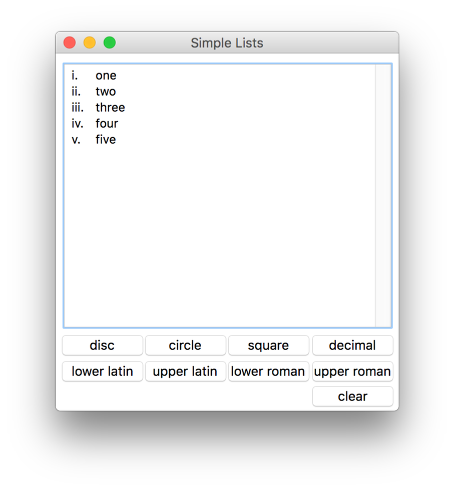 repeat with tLineNum = 1 to the number of lines of field "text"
Note: You can mix listSyles within a field. Each paragraph does not have to have the same listStyle. Paragraphs with a non-empty listStyle present themselves in htmlText wrapped with <LI> tags. Sequences of such paragraphs with the same listStyle are bracketed by <UL> or <OL> tags. These tags take a type attribute, matching the (legacy) HTML attribute of the same name. As it stands the listStyle property does not save into the stack-file, to ensure persistence of listStyles we will save the htmlText of the field as a custom property of the field. This is saved when the stack is saved and can be used to restore the content and styling of the field when the stack is reloaded. When the stack is closed we want to save the htmlText of the field as a custom property of the field. To do this we handle the closeStack message. This allows us to save the htmlText before the stack is closed. set the cHTMLText of field "text" to the htmlText of field "text"
When the stack is loaded we need to retrieve the custom property we saved in the last step and set the htmlText of the field to what is stored in the custom property, This will restore the listSyles of the field. set the htmlText of field "text" to the cHTMLText of field "text"